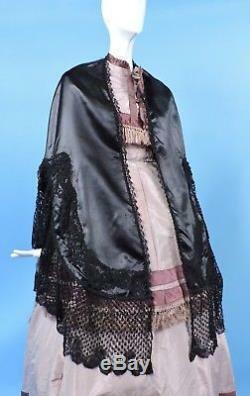 GOTHIC MOURNING CIVIL WAR ERA BLACK SILK SATIN SHAWL W LACE TRIMS. ACQUIRED FROM THE EMORY/POWERS FAMILY FROM MONROE, NEW HAMPSHIRE. DATING TO THE CIVIL WAR ERA. 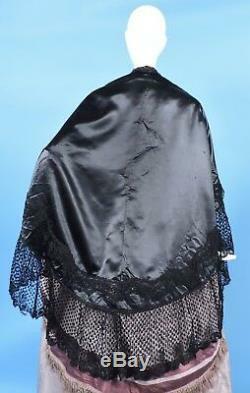 FASHIONED OF A HIGH SHINING BLACK SILK SATIN WITH PIPED SEAMS AND A ROUNDED REAR WITH LONG TAILS IN THE FRONT. 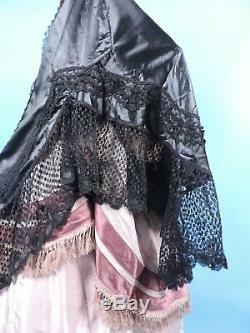 THE BLACK LACE HAS SOME SMALL BREAKAGE, BUT IS FRAIL, I PERSONALLY WOULD REMOVE OR REPLACE. THERE IS A SMALL AREA OF PIN POINTS OF WEAR ALONG THE CENTER REAR WITH FIVE ERASER SIZED AND PINHEAD HOLES. These are antique articles, having the age stated. All flaws if any are painstakingly outlined. _gsrx_vers_837 GS 7.0.15 (837). 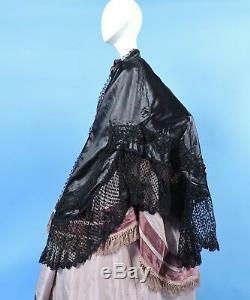 The item "GOTHIC MOURNING CIVIL WAR ERA BLACK SILK SATIN SHAWL W LACE TRIMS" is in sale since Sunday, August 12, 2018.